Well, that is the end of the Perfect Chemistry series. And I kinda feel let down, to be honest. 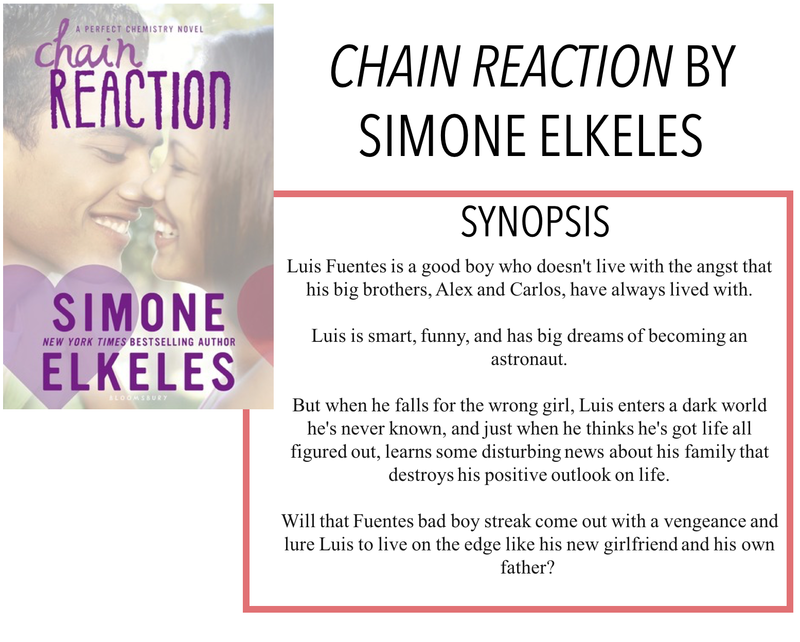 I am back with another book review, today is Chain Reaction by Simone Elkeles. This final book follows the youngest Fuentes brother, Luis. He's the straight A golden child, but he has a bit of a wild side. If you've read the other books, you will pretty much know how this goes: a Fuentes boy, poor, wrong side of the tracks, etc. meets a girl from the other side, usually too good for him. The parents disapprove, the whole nine. Obviously, there's some gang stuff, because that's just how it goes. Luis turns out to be a bit of a jerk, Nikki loves to hate him and in the end, they are perfect for each other regardless of the lies. If it sounds like I'm being sarcastic, I am. In fact, I am a little fed up with the Fuentes boys. The other two books were tolerable. I think part of it was that I read them so far apart, I forgot how similar the boys are. And reading this one on the heels of book two, I'm less than impressed. Instead of a rich white girl love interest, Elkeles creates a rich Mexican girl love interest who, at least by the Fuentes' definition, may as well be white. I really disliked Nikki throughout this book. She was annoying and despite seeming like she knew what she wanted and that she was above Luis's games, she fell for him every time. She kept going on and on about trust and honesty, but when she suspected something was up, she let it go, because if it's something important, Luis would tell her. Ever heard of a lie by omission? I don't know why this book is getting me so worked up, I thought I was enjoying it until I sat down to write this review. The storyline was so overdone in the other books the only real reason I kept reading was to see snippets of the other brothers' lives now. I didn't really like Luis either, he was supposed to be this great guy and then he basically is portrayed as a jerk. He is going along fine and then decides that he's going to just go off the deep end. I just don't understand where his logic was coming from, especially when he is supposed to be the 'smart' brother. I felt no connection with Luis and Nikki. At least in the other books, there was some chemistry (ya, I went there). In this one, their relationship was so hot and cold I couldn't get a grasp on why they were together in the first place. I think this series would have been better off ending at book two. There was no new plot line, I'm not even convinced there was a plot line of this book, and I just feel like it's not necessary or good enough with the other two. Overall, I am disappointed that this series didn't finish stronger.